The Prospect is a new highlight among MX goggles and has never been on the market like this before. It gives the rider a maximum field of vision due to the extra height of the lens. In addition, it features an innovative SCOTT lens lock system that makes the lens stay in the frame no matter what impact is coming from outside. 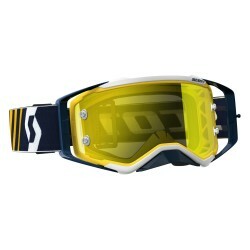 To avoid slipping of the goggle, it is equipped with an extra wide, no-slip silicone strap. This strap together with articulated outriggers, highly contribute to the improvement of the helmet integration. Last but not least, a great feature of the Prospect is that it comes with two lenses – chrome and clear - ideal for any weather conditions.